It was two to three years into ownership, around 1983, that EMI began to reissue titles from the Blue Note catalogue. The reissue strategy was deep, drawing on a large number of titles from the catalogue, in a three-pronged global programme . In the US market, EMI deployed its Manhattan imprint, in Europe, its French partner EMI Pathé-Marconi, and in Japan, its subsidiary Toshiba-EMI, who took over where the United Artists partner King Records left off. The new corporate strapline became “The Finest In Jazz Since 1939“, except for our friends in Tokyo who favoured a facsimile of the original label. Blue Note reissues in Japan have been extensively covered by LJC here. Part-way through their reissue programes, US and European vinyl manufacture adopted the German Teldec DMM (Direct Metal Master) technology. DMM promised lower cost and quicker production time with the appearance of technical advance, but with highly variable results. Pathe-Marconi adopted a Japanese-style obi for its Cadre Rouge DMM series. Japan alone remained pure traditional mastering technology, though with an increasing amount of digital processing over time. In the specialist jazz collector niche, starting in 1984, Michael Cuscuna’s Mosaic label was licensed to distribute a strictly limited-numbered artist-based box sets. 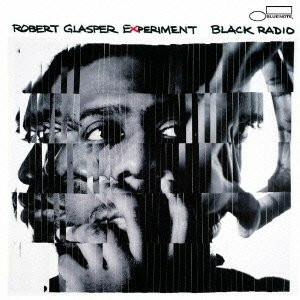 Most are re-mastered by Capitol’s improbably named engineer Ron McMaster, but a handful by Rudy Van Gelder. Typically between three and 10 LPs in a box, runs of 3,000 to 7,500, these are mostly now out of print, highly collectable, and expensive in the second hand market, especially the various Miles Davis sets – which of course are mostly Columbia recordings and not Blue Note, but deserve a mention anyway, as every Blue Note collector should own them. These are the Complete Blue Note box sets, some are CD only, those on vinyl can be very hard to find, but worth the effort. The editions above are grouped by instrument rather than chronology, makes more interesting viewing. There are a lot of pianists/ organists, who differ mainly between whether they are facing left or facing right on the cover. Only one guitarist, one trombone, two drummers, a good brass line up, and just one type of artist not present, can you guess which? Clue: singers. The popular concept of “jazz” is a sultry singer in an hour-glass cocktail dress. Historically it is an instrumental club, and rather lacking in…. identity politics has made certain words toxic so choose your own, the opposite of “men”. 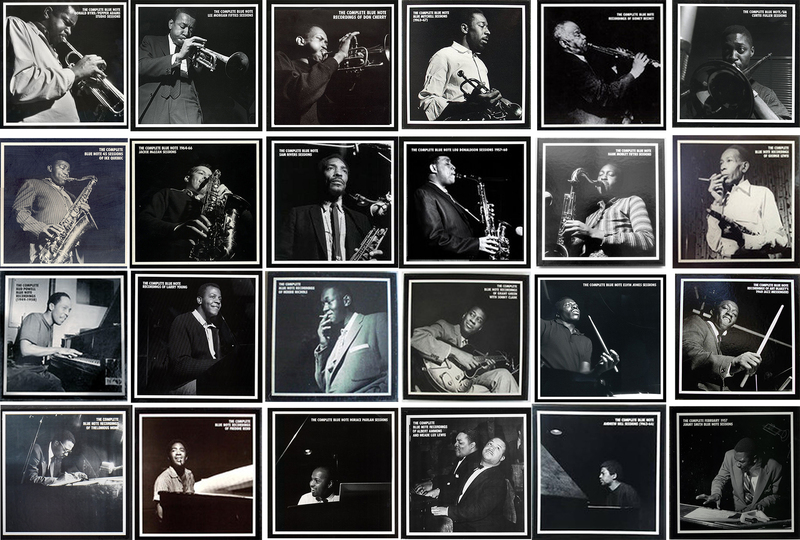 Mosaic continue to produce a small number of 180gm “audiophile” LP sets today but most output is now only CD, including the CD-only Mosaic Select artist series which include a number of Blue Note artist recordings. 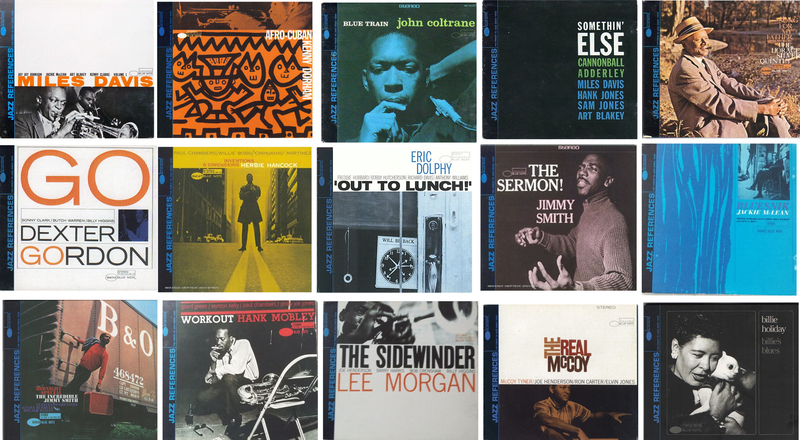 A number of budget reissue labels like Applause, Pausa, Sunset and Upfront reissued a handful of more popular Blue Note titles, or assembled compilations. 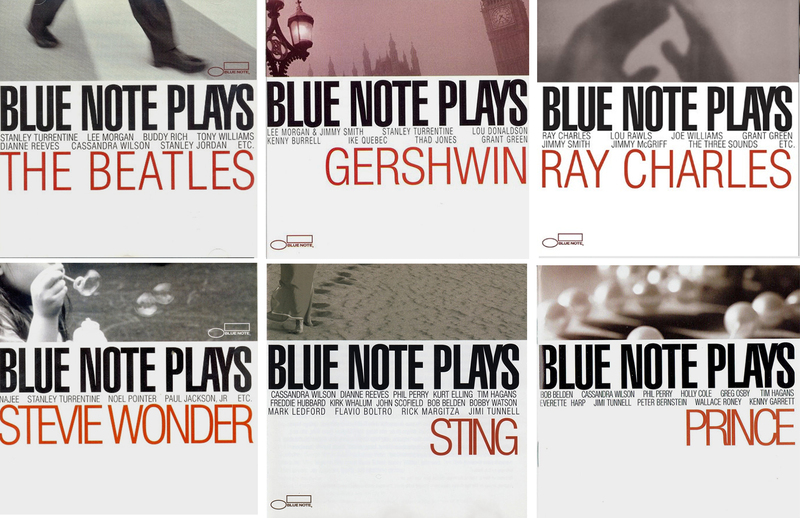 Other national editions: elsewhere in the world, a small number of Blue Note titles were licensed to local EMI subsidiaries or other local companies including in UK, Holland, Denmark, Germany, Italy, Greece, India, Brazil, probably others too. These are often identifiable by royalty collection organisation logos on the label (GEMA, BIEM, JASRAC, SACEM and similar) and “eccentric” catalogue number variations and suffixes. OPINION: Caution is required with overseas editions, which were mastered locally from copy tape and not the original tapes, which remained in the US vaults. Local pressing facilities of variable quality were engaged, though German pressings are among the better ones. The mid-’90s saw the last in-house EMI Blue Note vinyl initiatives. The Blue Note Connoisseur series offered a selection of classic titles, and Rare Grooves series catered for the funk-hungry listener. Some Connoisseur records are allegedly digitally re-mastered, others pure analog. Most are stamped “Mastered by Capitol” and signature engineer “Wally” (Trautgott) etched. Connoisseur editions depend for identification largely on the blue/yellow sticker on the shrink, which of course disappeared when the shrink went. All these have an modern catalogue number B1 ##############, not that of the original title. There is also a Top Ten Series of titles, unclear how to identify these. After these, EMI withdrew from Blue Note vinyl production altogether and instead licensed specialist labels such as Classic Records and Mobile Fidelity to meet enthusiasts demand for heavy-weight audiophile vinyl editions. They were joined subsequently by Analogue Productions, and Music Matters, who produce some of the best audiophile editions available today, re-mastered directly from the original Blue Note tapes. OPINION: My only Analogue Productions 2×45 rpm had some unforgivable surface noise fresh out of the factory, and sounded sonically botoxed, not an experience I cared to repeat. I have never heard a Mobile Fidelity press, so I reserve judgement. Their output seems mainly classic rock and pop, jangly electric guitars and vocals, which I don’t take as a good starting point regarding wordless acoustic modern jazz. Claim ultra-silent vinyl, chunky 200gm weight, and some replicate the deep groove – a nice touch. The two copies I have bear etched initial “BG” (Bernie Grundman, I presume). , They seem out of the same stable as the Connoisseur series – intending to to deliver a “modern” presentation which sought to “improve” on the original. Characterised by “widescreen” stereo sound stage, silky presentation, are also notable for their art-quality black and white gatefolds, with Francis Wolff recording studio photography. Initially pressed at 2×45 rpm discs, the latest edition are 1×33 rpm, and to my ears sound superior, which may not be unrelated to technical improvements at Kevin Gray’s engineering base, RTI. OPINION: Each of these manufacturers have a faithful following among jazz enthusiasts, and people should make up their own minds after comparative listening for themselves. If you haven’t compared, you don’t really know anything, though most people seem content with what they have got and stop at that. Fair enough. A lot depends on what your turntable and system is able to extract from these audiophile editions – if that made no difference why would anyone bother to spend money on “good” hi-fi? Also tastes differ regarding musical presentation. I prefer original Blue Note era pressings, and for early Van Gelder recordings I prefer his mono mix. I realise that is a counsel of perfection for many collectors, and unrealistic for many titles. However that doesn’t make it wrong, just because it’s difficult. By the mid 80’s, vinyl was struggling as a mainstream music distribution medium, as the scratch-free and more portable CD gained popularity, enabling “music on the move”. 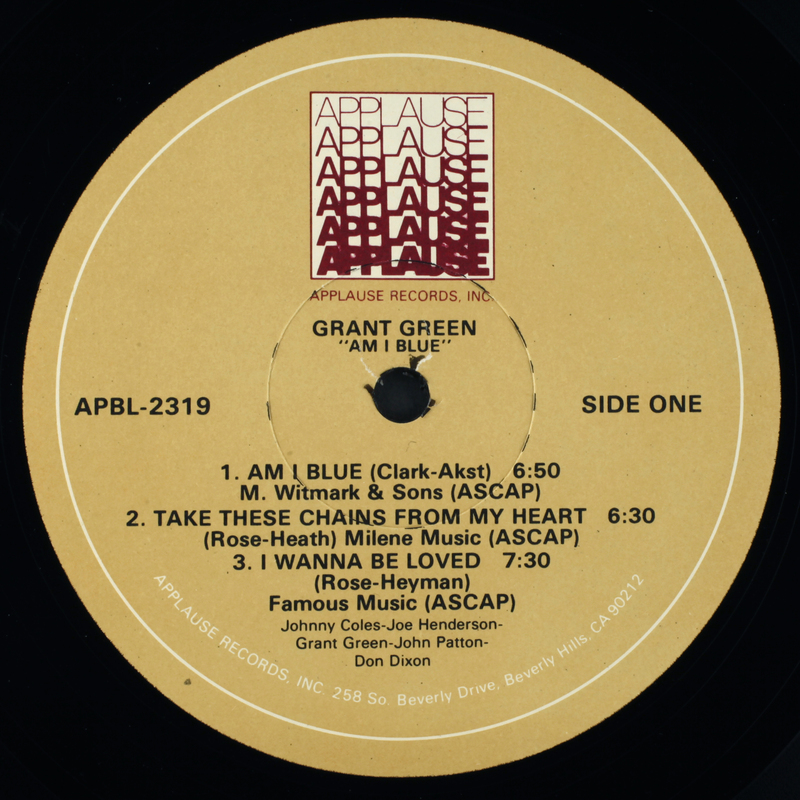 Commencing in the mid-’80s, as early as 1984 in Japan according to one expert, the Manhattan imprint launched Blue Note on compact disc, segueing the late ’80s into Capitol Records. The Cuscuna/Ruppli encyclopaedic Blue Note Discography, Compact Disc Numerical Listing, devotes over 50 pages to CD releases in US and Europe, (some only for Europe) before embarking on Japan, which covers a further forty pages of CD releases with the likes of Super 50 series, CD Treasury series, and 24-bit by RVG series. My rough maths suggests as many as 5,000 entries for CD releases. Too much, for this vinyl-lover to get a handle on. Those knowledgeable in such matters may suggest the early CD digital transfers are to be avoided. There are 50 Shades of Evil? Interestingly, the debate over what I call “primitive stereo” (hard panning) and balanced soundstage rears its head again. Somewhere here Blue Note issued a 50th Anniversary Series (1989), though I didn’t find any distinctive visible history. From my own collection, Connoisseur CD series started around 1995 until around 2002, with mastering initially in 20 bit, then 24 bit resolution, mostly by Ron McMaster. Blue Note Collector’s Choice series (1995+) offered a wide range of early and later Blue Note titles proudly claiming to be digitally re-mastered from original analog two-track tape in one step, by Ron McMaster. As well as familiar titles, the series squeezes in some interesting later oddball recordings like “Chamber’s Music” These may be a step on from the Manhattan years, but pre-date the Rudy Van Gelder Re-mastered editions. Blue Notables series (1996 UK only) A thematic compilation CD series raised the play-on-words stakes with titles like Bands On The Run, Six Vital Organs, Shades of Blue Funk, Blue Bloods, New Bloods, the enigmatic Blue Divas (singers who must have escaped my attention at the time) and Chet Baker finally earns a place among the Blue Notables. Blue Note issues no longer had to be just of Blue Note artists, some Pacific Jazz recordings begin to appear under the Blue Note imprint. The scene was set for thematic compilations. The Jazz References series (1998-2000 country of origin unknown) brought back all the familiar albums, possibly with the lure of bonus tracks. They say an artist knows his career is finally run its course when his latest record release is “The Best of <insert name here>”. My instinct is to stay away from relentless reductionism, Best of being the other end of the completist spectrum, All of. Neither is a good way to experience music which is session-based, rooted in one point in time, one team of players, one recording date. Does The Best of Hancock include the Best of Wayne Shorter? These deserved to be not collectable, examples below. The Japan 24-bit by RVG was paralleled in the US and Europe with the Rudy Van Gelder Editions, which were reissued steadily over the decade between 1999 and 2009. All my RVG CDs are European editions, insert printed in the rapidly disintegrating European Union. The Evil Silver Disc had finally triumphed. Darkness covered the earth, vinyl was cast out, to the garage or to the loft, or worse – the car boot sale and thrift shop – replaced by the mirage of technological progress and the energy-saving false friend, convenience. But musically, worse was yet to come. Paradigm shift: from reissuing albums, to repackaging recordings by theme and mood, for a changing demographic. Not content with reissuing original Blue Note albums, in the decade that followed, every imaginable opportunity was taken to repackage Blue Note recordings, mixing artists, themes, styles, moods, even DJs remixing original recordings for the contemporary club and dance-floor audience. Mostly, though not entirely, on CD. Woah! (twists baseball cap sideways) Gilles Peterson, my office now. We need to reach out to the new generation of music consumers. We need to go further, not to re-issue, or to re-master… we need to re-mix this great music, and, and, put more emphasis on the rhythm. Let’s revisit Blue Note, with an eye on the dancefloor and D.J. demographic. Umm, Gilles, does one twist one’s baseball cap to the left or to the right? Getting you in the party mood. Great! – if you like parties. Music for Lovers (just not necessarily music-lovers). At this point, my heart sinks as I see my favourite artists reduced to digital Viagra. Think about it. Is 72 minutes of CD too long? Only asking. It doesn’t take that long to eat an apple. Blue Note Plays…second fiddle to other popular artists. I draw the line at Blue Note Plays Stink Sting. Somebody call the (taste) Police? 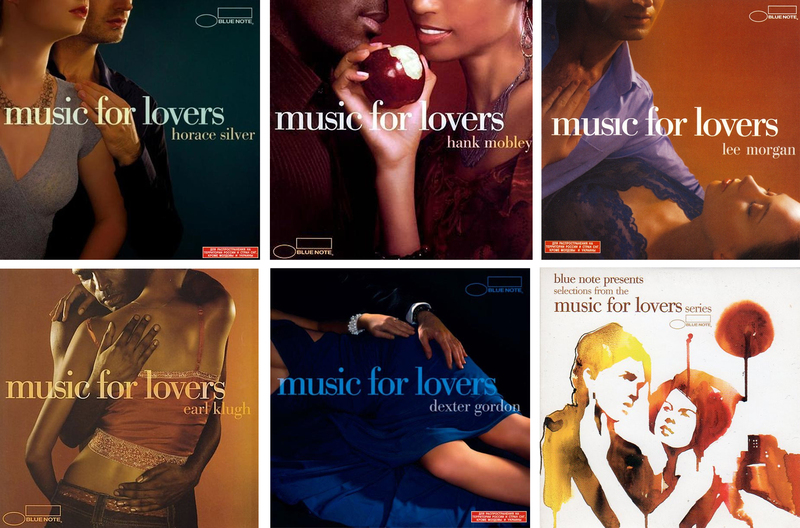 1996-2006, no nook or cranny left unexplored in repackaging the Blue Note legacy, even cannibalising selections from a repackaging series, as in “Blue Note presents selections from the ‘Music For Lovers’ series” – a compilation of compilations. It is a sobering sight to see EMI struggling to monetise the Blue Note asset against an evolving demographic and social lifestyle marketplace. Returned to artist compilations, fully utilising the double cd capacity, which allow you two to three hours of continuous Art Blakey thunder drums (Honey, get me some asprin, will ya?) and new Blue Note artists (cough) Count Basie and Django. CD for the completist, yes, but where is The Ultimate Hank Mobley? 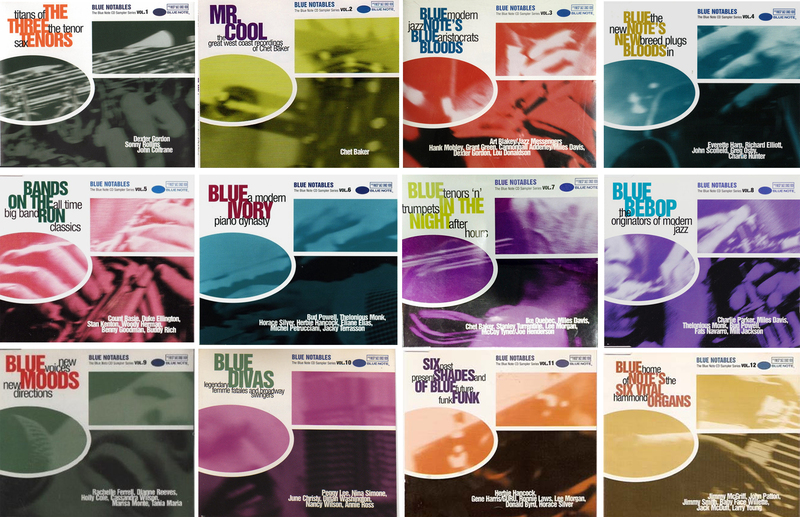 Around 2014, the 75th anniversary of the Blue Note label, around a hundred of the bigger-selling titles were re-released on vinyl again by Blue Note, “Back To Blue”, targeting a budget-conscious younger generation of new vinyl adopters, introducing them to the modern jazz genre, MP3 download coded included, for listening on the move. It must be said the series has been dogged by questions over manufacturing quality, given the necessary low price-point. However, tactile artwork and vinyl ownership through budget turntables has given the old dog a new lease of life. Blue Note 75th Anniversay was celebrated with a Thames and Hudson coffee table book, with yours truly contributing many of the record photographs, which was a fitting recognition. Blue Note forever.